MJ's Pizza Bar & Grill, Matawan : Tequila 'n Taco Tuesdays! MJ's Pizza Bar & Grill - Tequila 'n Taco Tuesdays! 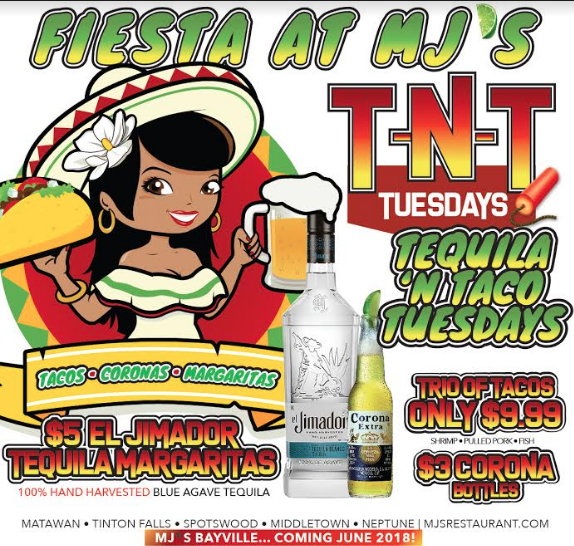 At MJ's at Buttonwood Manor in Matawan, get your Fiesta on every Tuesday with their TNT Tuesdays...that's right, Tequila 'n Tacos! Get your hands on a trio of tacos for just $9.99, $3 Corona bottles, and $5 El Jimador Tequila Margaritas! What could possibly be wrong with that? Absolutely nothing! To view their menu in it's entirety and see other selections such as sushi, cocktails, martinis, desserts and more, click here! World Welterweight Championship- It's On!